1 Therefore, holy brothers and sisters, who share in the heavenly calling, fix your thoughts on Jesus, whom we acknowledge as our apostle and high priest. 2 He was faithful to the one who appointed him, just as Moses was faithful in all God’s house. 3 Jesus has been found worthy of greater honour than Moses, just as the builder of a house has greater honour than the house itself. 4 For every house is built by someone, but God is the builder of everything. 5 ‘Moses was faithful as a servant in all God’s house,’ bearing witness to what would be spoken by God in the future. 6 But Christ is faithful as the Son over God’s house. And we are his house, if indeed we hold firmly to our confidence and the hope in which we glory. I read this passage and a sense of awe strikes me... I would like to sit and meditate upon this one for awhile, actually - for the sake of my own heart, attitude, walk and understanding. Over on my main site, 'Hope Mountain', I've been going in search of my true identity - you know, the real me, the me that God created in my mother's womb - and that for a purpose, the one who has to answer for her heart and life rather than for anyone else's, and not the 'me' that was somewhat messed up by life on this planet - and, as I'm walking that path and strolling through Hebrews at the same time, a greater sense of respect for Jesus is rising in my heart, but the words needed to express the emotion in my heart are difficult to come by. 19 Do you not know that your bodies are temples of the Holy Spirit, who is in you, whom you have received from God? You are not your own; 20 you were bought at a price. Therefore honour God with your bodies. We are the temple, in which the Holy Spirit dwells. We are 'the House', Jesus is the Builder. We are "God's House", over whom Jesus faithfully watches. I like that... and it reminds me of what I believe the Holy Spirit has been drawing my attention to more and more of late: We [humans] spend so much time looking 'out there' for what will make us feel happy, loved, worthy, wanted and so on, and by doing so we fail to find true love, true happiness, true worth, joy and peace that won't be shaken when the storms of life strike. But God is in us. When we accept Jesus as Lord, God comes and makes His home with us. 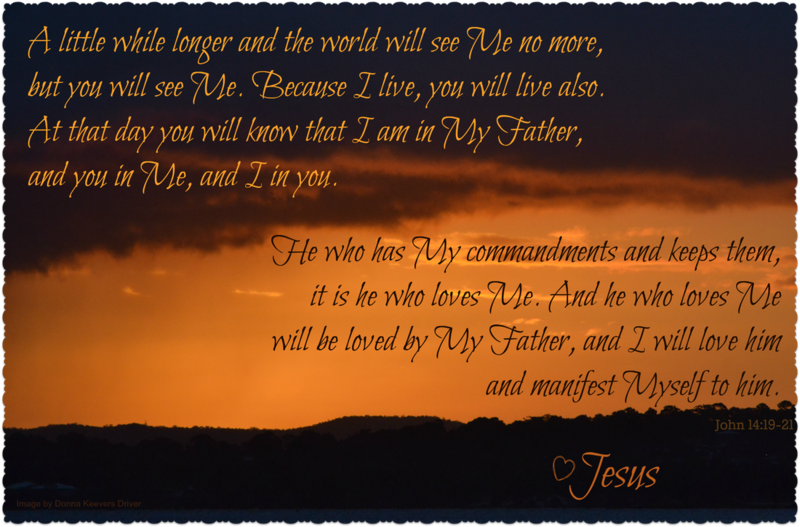 28 ‘You heard me say, “I am going away and I am coming back to you.” If you loved me, you would be glad that I am going to the Father, for the Father is greater than I. 29 I have told you now before it happens, so that when it does happen you will believe. 30 I will not say much more to you, for the prince of this world is coming. He has no hold over me, 31 but he comes so that the world may learn that I love the Father and do exactly what my Father has commanded me. SIDE NOTE: I hadn't intended to add versus 28-31, but 31 is quite powerful, isn't it: Jesus says, '...he [the prince of this world; our enemy; the devil; Satan] comes so that the world may learn that I love the Father and do exactly what my Father has commanded me." I have read the Bible a couple of times, and passages from it many more times, but I don't remember ever seeing that before: Satan comes so the world may learn that Jesus loves God and does exactly what His Father commands...?! Talk about the darkness proving the light! :D Gotta love that. Before getting back to my main thought concerning the verse of Hebrews pasted above, I would just like to share that the closer I get to God, the more I understand the 'dark' moments in our walk with Christ are allowed solely to benefit those God loves, and Satan still loses. I believe - more-so these days, that we, as followers of Christ, need to get a handle on that truth. We need to trust that, even in the darkest moments of our lives, Satan has no hold over us (unless we let go of God and cling to sin, but even then, God's not finished yet) and victory will be ours. Getting back to the Holy Spirit in us, Jesus in us, God in us, and us in Them... I think many of us forget the 'in' part, especially the God in us part. We place God 'on high'; when we worship Him we raise our hands to 'heaven' and picture Him 'up there'; we think of Him 'out there somewhere, beyond all we see', but He's not. He's IN us. When I was a young Christian, I was praying one day and looking up towards the heavens as I did, and before my thoughts were finished being placed before God, I heard Him say to me (in my heart), "Why do you pray to Me out there? I'm in here..."
But you know, because I had a grave fear of man and bowed to their opinions more readily than I did to the revelations God gave me personally, I found next to no confidence in what was 'in me', including God's presence, and off I went, looking 'out there' for something to make sense of what was in me; someone to fill that emptiness within me; something to keep the light on so I would not find darkness... What a fool I had been in this. Since returning to God wholeheartedly in the past several weeks, aching to have the fear of man taken from me, I've come to see how much of God, and of joy, and of love, and of peace, and of me, I've lost and missed out on over the years by looking for such things externally. I am convinced now, far more than I was prior to my 'finding my identity in God' journey, that the answers do no lay out there somewhere; that the true love we search for does not come from somewhere out there; that happiness starts within; that true love must be found in our own heart then passed on to others - for God first loves us - not found in others then taken to ourselves; that if we base our confidence and hope on things 'out there' we will be disappointed and lose courage and joy; that peace can help us through the painful and hard times when darkness comes, if we find it within, in God in us, rather than on external things; that darkness is not a time to fear but a time when we go into deeper intimacy with God, if we trust He is still within us, and know that the darkness is not in us, it is passing, and God will create, and bring, great things out of it for us. We often trust the darkness more than we do God. We feel the darkness more readily, because we take in our circumstances, the things of our external life, and draw them into our heart, trusting how they make us feel, then we go off and huddle up in our corners or under our beds, scared of what will be. But when you're walking close to God, when you get to know Him and His love for you, you will learn that He is within you, not the darkness; that you need to go internally, to where God is, to hear His still small voice, to be wrapped in His love, mercy, grace, truth and light, as He deals with what comes against us. You need to be as Jesus was: 'He in me and me in Him..."
We must stop asking our feelings to trust what happens 'out there', and turn to God within, trusting that we are His, we are His house, His Spirit lives in us, Jesus faithfully watches over us, and if the enemy comes near us, "he has no hold over me, 31 but he comes so that the world may learn that I love the Father and do exactly what my Father has commanded me..."
20 “I do not pray for these alone, but also for those who will[e] believe in Me through their word; 21 that they all may be one, as You, Father, are in Me, and I in You; that they also may be one in Us, that the world may believe that You sent Me. 22 And the glory which You gave Me I have given them, that they may be one just as We are one: 23 I in them, and You in Me; that they may be made perfect in one, and that the world may know that You have sent Me, and have loved them as You have loved Me.